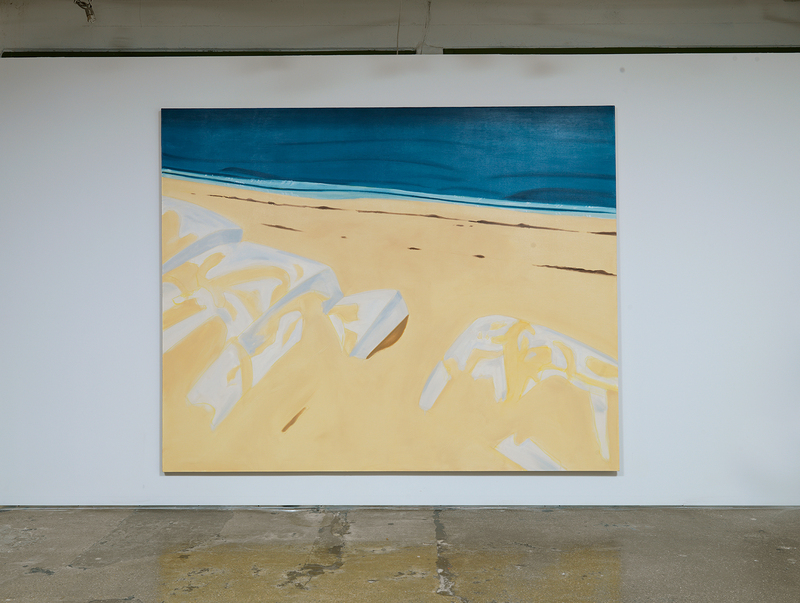 Alex Katz’s three works in Surviving Sandy are painted images of bodies of water. During the show they occupied the large back wall of the first floor, the installation itself therefore an invitation to compare the paintings to each other and consider their roles in a group. Beyond the immediate, obvious similarity that there’s water in all the paintings is a curious compositional relationship: none of the three paintings provide a visual escape from the horizontal plane. When a horizon line is present, it divides not between land and air but land and sea, describing a space that extends laterally and not vertically. There is no up and down but only further out and closer in. Alex Katz, “Rocks,” 2011. Oil on linen, 72 x 196 inches. Courtesy of the artist. The works also privilege a scenic understanding of water over a material or physical one, effectuated by creating a sense of the water’s separateness from the viewer. In Rocks 2, we are separated from the sea by distance, the direct experience of the beach mitigated by the expanse of the vista and length our eye must travel across the sand. Rocks has the most obvious barrier, the eponymous stones forming a shallow fence between the beach and the night-sky-like sea, the dramatic horizontality of the structure and composition emphasizing the distinction between the space of the viewer before the rocks and the space of the water behind them. Even in Marine 11, where the water takes up the entire canvas, the stillness of the surface suggests that it is undisturbed and seemingly untouched. These two features—the inescapability of the scene on the one hand, and a sense of its inaccessibility on the other—create an enduring tension regarding how we view the works as images. The paintings’ perspectives position the viewer almost inside the space of the scenes—nearly in front of the rocks, just inside the water, at the far edge of the beach—making it all the more surprising that the water seems to keep us at arms length. 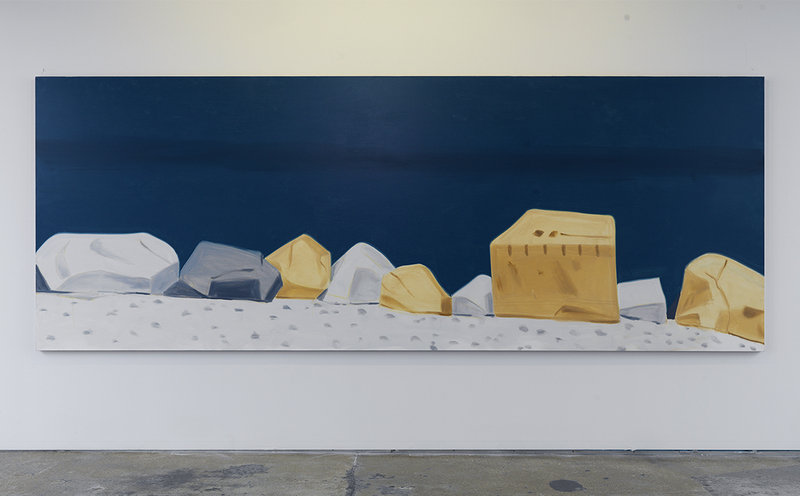 Alex Katz, “Rocks 2,” 2012. Oil on linen, 96 x 120″. Courtesy of the artist and Gavin Brown’s Enterprise. On the level of process and material is another hint of this duality: the paint is applied with Katz’s characteristic straightforwardness, but the works are large and sparse enough that the individual brushstrokes used to depict the water, sand, and rocks carry a hint of “gestural” warmth. The directness of Katz’s description leads the viewer to see these works immediately and primarily as images of their subject matter; although as images, they remain staunchly visual, despite the physicality of what they depict. Physicality lingers in the touch: the actual paint retains its materiality in relation to an experience of the surface as “painted” rather than in relation to the material identity of water, the beach, or rocks. This quality is most apparent in Marine 11, whose monochromatic ripples almost elude identification as water entirely, coming just shy of being a color-field painting. These paintings find in water a portrait of the act of painting. Watching water requires a lot of the same skills as looking at painting does: we watch the surface for subtle shifts, currents, and patches of light, the passage of time marked by the reiterative pulsing of brushwork and waves. The distance Katz creates by separating the viewer from the water-as-image allows him to create an intimate experience of the surface as the product of this observation through paint. Indeed, one could say that Katz treats these water and beach scenes with the lovely and semi-inscrutable air common to his portraiture. In this case, however, the portrait in question is not “of” the subject of the paintings. Rather, these paintings find in water a portrait of the act of painting.